HEATHROW, UK. 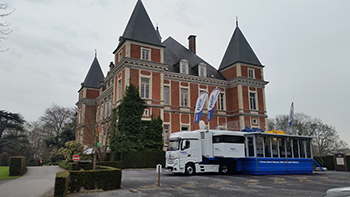 21 April, 2016 – Tyco Security Products announces it will hold a series of technology training events and technology demonstrations throughout Western Europe using the company’s Mobile Exhibition Unit, a state of the art mobile classroom and training center that houses the company’s full portfolio of solutions. The 2016 tour will include locations in Ireland, Belgium, The Netherlands, Finland, Germany, England, and Italy, beginning in April and ending in late 2016. 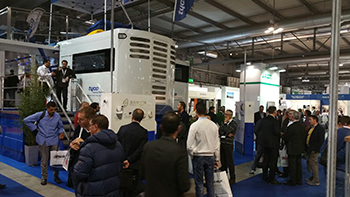 The Mobile Exhibition Unit (MEU) is a fully self-contained, self-sufficient training and exhibition environment that can hold up to 27 people. Inside the MEU, attendees can observe and be trained on a full complement of product ranges from Tyco Security Products,including theComplete Security Solution for unified DSC intrusion, Kantech access control and exacqVision video surveillance. The MEU will play host to free one-day educational sessions for dealers, integrators, monitoring stations and customers, who receive hands-on practical training on the latest security solutions. Classes will be capped at eight people per session, to maintain a practical, personalized educational environment. In addition to offering training classes on the C•CURE 9000 Security and Event Management platform and the Visonic line of intrusion products, the MEU will be exhibiting at 25 different trade shows across Europe in 2016, including IFSEC International and security essen. The MEU’s free demonstrations at these events provide the opportunity for visitors to meet with sales and technical teams, participate in discussions and offer feedback on the company’s current technology offerings, integrations and product roadmap. There will be hands-on demonstrations of security solutions from alarm and intrusion brands DSC, Visonic, and Bentel Security, access control brands CEM Systems and Kantech, and American Dynamics and Exacq Technologies for video surveillance. To register for the free events and for additional information, including a complete event schedule, please contact your local sales representative through www.tycosecurityproducts.com.